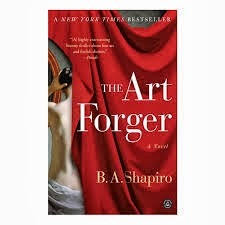 a book chick: "The Art Forger"
my take: I couldn't decide at first if I liked the writing style or not ... and then I got to that point in a book where I read until 12:30 a.m. to finish ... so I guess I liked it well enough. It's not terribly sophisticated writing but a good plot line. Especially if you, like me and most members of my family, love art history. The story centers around the actual robbery of thirteen works from the Isabelle Stewart Gardener Museum in Boston in the 90's and takes place in current Boston. A bit historical, a bit art historical, a bit intrigue-ical ... easy read even if I felt a bit uneasy periodically - was she doing the right thing? Our heroine Claire is a mixed bag and as her history is revealed the story gets more interesting. I'm with you - perhaps b-level writing, but the plot was good enough to get me trough a 9-hour flight! Kind of an art history mystery - right up my alley, anyway.